Get your designs converted to a format you can send out in an email from just £150. Sending out emails and newsletters are a great way to stay in touch with customers, publish recent news to your visitors, and promote offers. By using our PSD to Email service we can turn your Photoshop files into a format that will work across all of the major email clients. 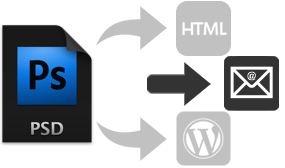 At the end of the project we can provide you the finalised HTML for you to send manually or, if you use a mailing list application such as MailChimp or Campaign Monitor, can add it to the respective account on your behalf.